Wan Mazlan holds up his trophy catch. 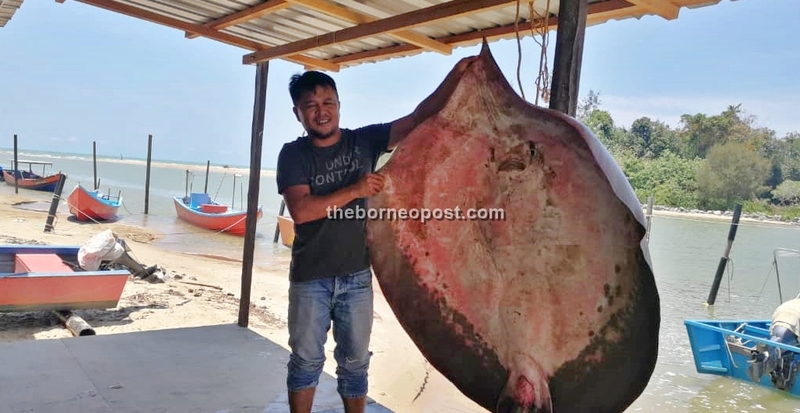 MIRI: Another giant stingray weighing over 150 kilogrammes was netted by fisherman Wan Mazlan Ramlee from Kuala Sibuti off Niah waters on Thursday morning. Last Sunday, a fisherman, Ramlee Jinal, 65, also from Kuala Sibuti netted a 250 kilogramme giant stingray off Kuala Niah on Sunday. According to Wan Mazlan, he and two other villagers went out fishing early that morning to set their nets at sea as usual at about 8am. The trio later came back to check their fishing nets at about 10.30 am and saw the giant stingray entangled inside one of the nets. “We were surprised by the catch as one of our villagers had caught a similar stingray earlier on Sunday, and we immediately pulled the net up and tied it to the side of the boat as it was too big to bring aboard,” Wan Mazlan told The Borneo Post yesterday. He said, reaching at a jetty at Kuala Sibuti, villagers also eagerly want to see their giant catch which they later weight the fish weighing over 150 kilogram. Wan Mazkan said, the fish was later brought to Bekenu as a buyer is already to buy the giant stingray after being informed of the catch. He said, stingray fish is nice to be barbecue or curry dish and asam pedas menu which are demanded not only by the local for these menu’s but also at restaurants and food outlets in Bekenu and Miri. He said, the price of fish is estimated RM700 and the trio are happy with the catch. The post Yet another giant stingray caught by fisherman from Kuala Sibuti appeared first on Borneo Post Online.